“The Umbrella Academy” is one of the new shows that Netflix is pushing forward right now. It’s a story based on comics written by Gerard Way (My Chemical Romance) and Gabriel Ba about a group of special children who are adopted by an eccentric billionaire and trained to become superheroes. The catch is that each of them are fucked up in their own way, and although they don’t seem to work well together, because they have very different personalities, they somehow compliment each other and make it work. I may be biased to the genre of superheros (and misfits), but I loved it. For me, the characters were the strongest part of the whole show, although the character development in the first episodes definitely took up a large chunk of time, so for some it might have been boring. Still, I thoroughly enjoyed it and it made me connect and care for the characters so much more. I loved Luther‘s innocence and his need to help (very Captain America of him). I really liked Diego, although I felt he was similar to Luther in many ways, except attitude, just because Diego is more outgoing and direct, whilst Luther is more calm and shy. Still, David Castaneda did a great job and I felt he was an important part of the team, even though his character was not as interesting as the others. I admired and appreciated Allison‘s sass, but also affection for her family, especially her sister. She honestly seemed the most mature and normal out of all of the them. Number Five definitely gave one of the best performances of the film, considering it was a teenager playing a 50 year old (a lot of sarcasm, witty lines and no fucks given). Ben (number 6) was underused (which is to be expected), but I liked what I saw so far, especially his interaction and chemistry with Klaus, so maybe we’ll see more of him in the second season. And Vanya (Ellen Page) had the biggest characters development, since she went from a small, fragile, ordinary girl, to…well, I won’t spoil it, you have to see the last few episodes. I even loved Hazel and Cha Cha, some of the villains, and that they had an actual storyline (Hazel and Agnes 4 ever). Klaus (number 4) was my favorite. Firstly, because he was played by Robert Sheehan, who I have loved and rooted for ever since Misfits (another great TV show, check it out). Secondly, because his character is the most unstable, outrageous, broken one out of all of them. He can communicate with the dead, and the idea of being constantly surrounded by dead people drives him crazy, so he turns to drugs and alcohol to numb his feelings and experience away. He really delivers a great performance and I love that he redeemed himself and tried to be a better person in the last episodes. Too bad he was taken very seriously by the rest of the team, I felt bad for him. In the end, they worked well together, and I really liked that it took them a while to get there. At first, Luther and Diego were too full of themselves to think about collaborating with the others. Number 5 thought he was smarter than all of them. Klaus was too high and unreliable to even contribute to the action. And Vanya didn’t think she was worthy. But circumstances changed and they had to adapt. It wasn’t perfect and they made a lot of mistakes, but that’s the beauty of it. I can honestly say that, by the end, I was so invested in the characters and their stories. I watched the first 7 episodes in one day, then the last 3 in the next day, and between that, I constantly thought about them and what might happen. If the Umbrella Academy kids would have existed in my youth, I would have probably been a fan (figurines and comics and all). I enjoyed the story, as well, although I felt it dragged at times. I understand it was for the greater good, since the characters needed to develop, so I went with it willingly, because I really cared for them. But some might not, so be warned. Oh, gotta say something about the soundtrack, it was fabulous. A great mix of 80’s, 90s and 00s pop and rock, that perfectly matched the story and the scenes. Like the dancing to “I think we’re alone now”, the Constantinopol song used for the action sequence, “Dancing in the moonlight” with Allison and Luther, and many more. Definitely a strong point for the series. (Surprisingly, only one Gerard Way song was used). 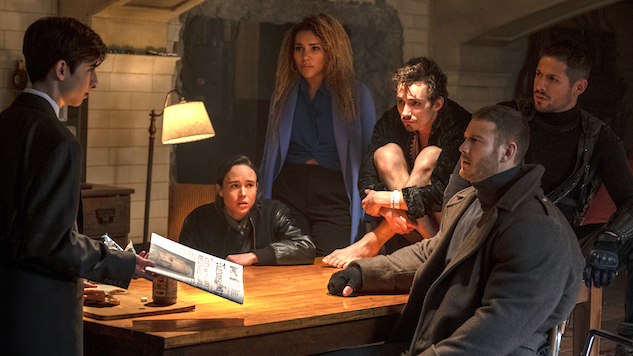 In conclusion, yes, you should definitely watch The Umbrella Academy on Netflix, especially if you like superhero movies, character development and fantasy. I had no idea it was written by Gerrard Way – that’s crazy! I’m going to give this a watch this week, I spotted it on Netflix over the weekend and thought it looked so mental it would either be terrible or amazing so I’m glad to read your thoughts! Great, give it a try, but also keep in mind that the first episodes are mostly character set-up. Stick with it and you will enjoy it! Thanks! :)) I feel you, I’m the same with most movies. Major case of FOMO. As for Ellen Page, yeah, too bad she isn’t getting more roles. She was great in this one, though…. I’ve been going back and forth on this one but your review definitely sells it! Definitely going on my Watch List and good to hear about the soundtrack- good music makes everything better 🙂 Happy Weekend!